World cardmaking day is one of my favourite days of the year. I love hopping along in all the fun bloghops and always try to take part in at least one challenge somewhere. There's a lot of fun going on around the web today. 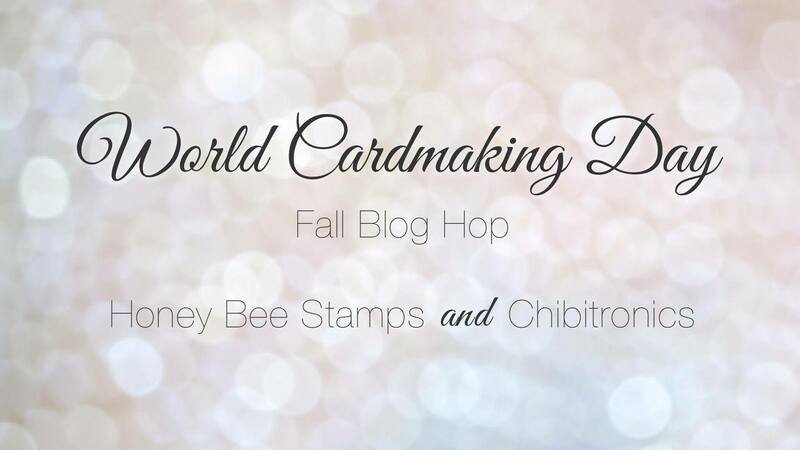 So I'm particularly excited to be a part of this hop along with Honey Bee stamps and Chibitronics. I hope you will find a lot of inspiration along the way and you have a chance to win some fun prices too. 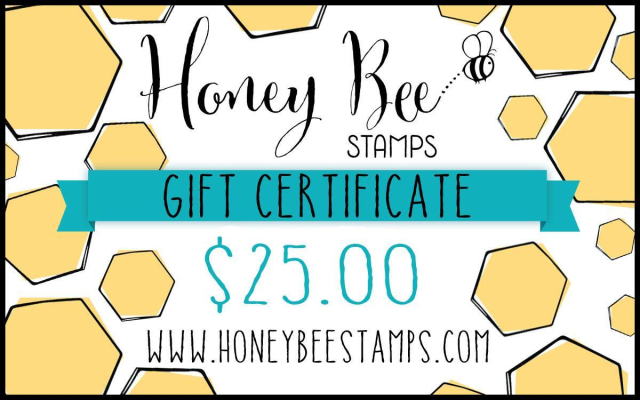 Honeybee is giving a $25 gift certificate drawn randomly from comments left across all blogs and Chibitronics is giving away a starter kit so you too can have fun and make light up cards and other crafts . Comments will close at 11:59 ET on Sunday, October 8th and the winners will be announced next week. 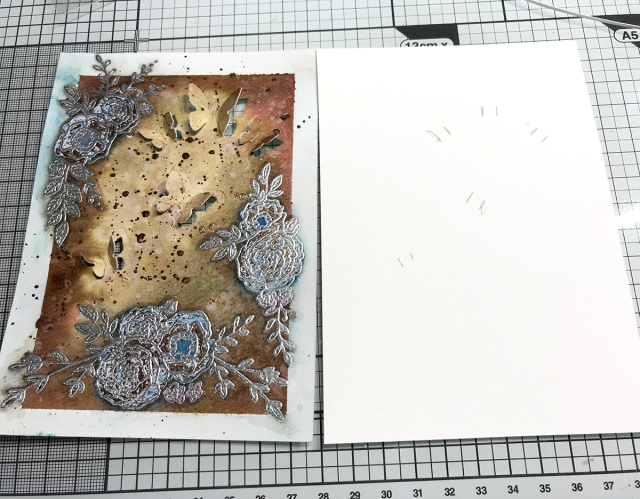 I absolutely adore this stamp set called Country Blooms so that's what I used for my card. 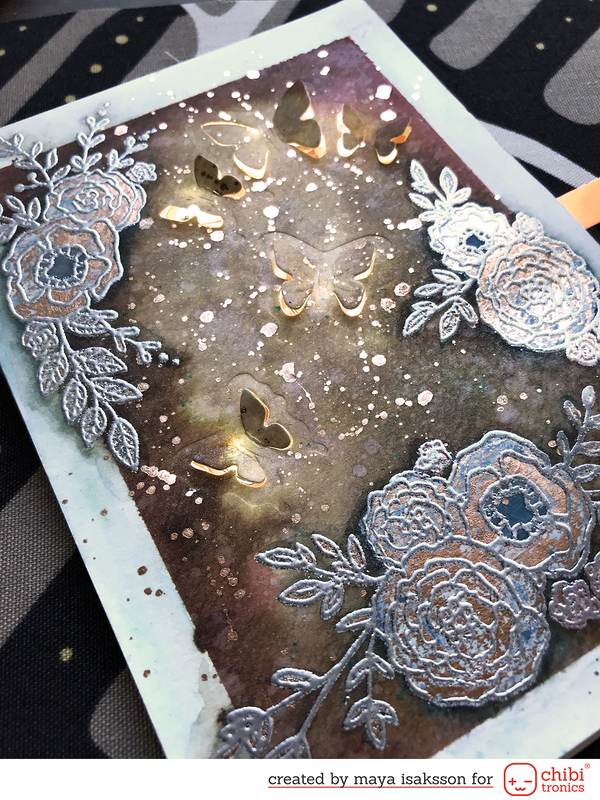 To be honest they gave me a bit of a struggle since I was experimenting with reactive mist and foil for this card and my idea of painting the flowers with mist and then foil them wasn't the success I was hoping for. I think more mist will solve this problem but I hate to toss anything I've started so I kept at it. I kinda liked the mottled effect of the foil. I watercolored the flowers red. Well, as you can see they are not red, it looked super weird. So I sort of lifted the color and added blue instead. 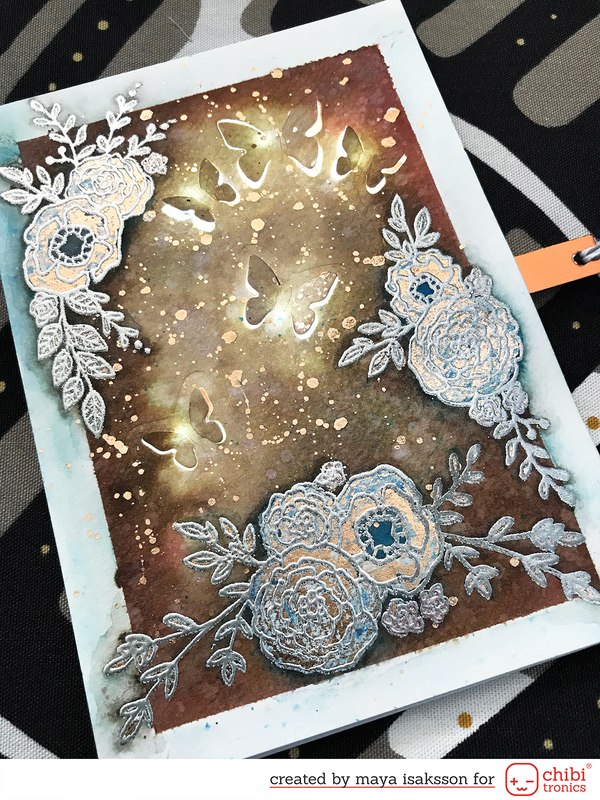 This was better but originally I had embossed the lines in a beautiful speckled embossing powder that did not make the flowers look flowery at all. So I embossed them again in silver (thank you MISTI for once again saving me from a bad decision) and it started looking better. When the background was in place I was actually really happy with the weird mottled flowers. Here's what went wrong next. 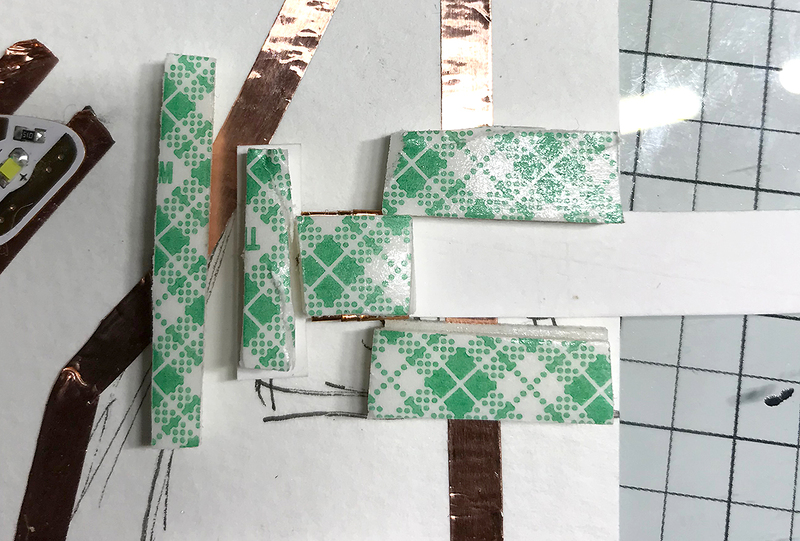 I was going to diecut text that would light up, using letter dies. Well when I started looking around ALL of my dies was missing. Turns out I had left them at a craft event I went to the week before. Doh! So, what to do then? I went through my stash with really old things that I haven't used for years and found this butterfly die that went perfectly with the flowers. It was so much better than the letters I had thought about so it all turned out well in the end but hey, this card was a struggle from start to finish! Still, I'm super happy that I did not toss it and started over. 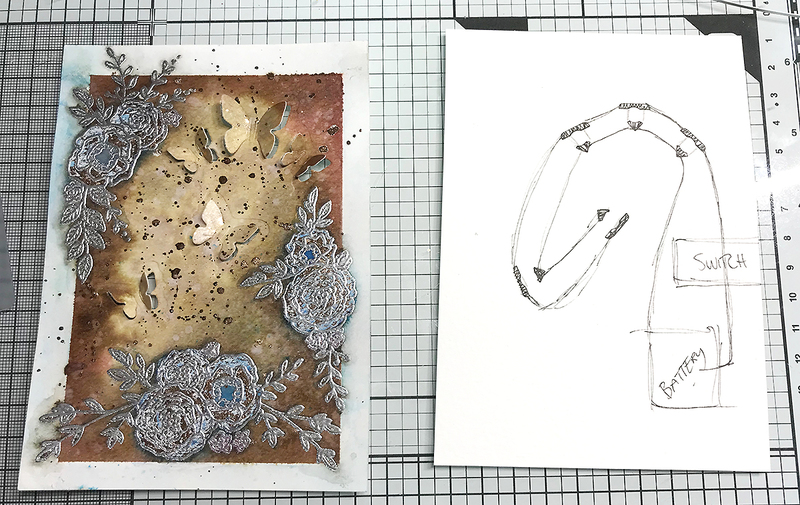 Look at the foiled gold speckles and the foil in the flowers. So pretty. And the lights from under the butterflies wings are really catching the foiled to reflect off the card. I don't even mind having mixed gold, rose gold and silver on the same card. My OCD was screaming STOP but I pushed on. Making the card I went through the same steps as I always do when adding LEDs. I have seen some of my friends on the Chibitronic teams very neat plans for their cards. Let's just say that I'm not a neat crafter. I'm more of a do-stuff-first-think-later kind of crafter. LEDs take a bit of planning but most mistakes is fixable when you suddenly remember you forgot to add a switch or place for the battery ;) Aaaanyways, I start by marking where the lights should be placed. In this case under the butterfly. I lifted the wings and drew small marks to see where to put them. I then drew out the circuit. As you can see, not tidy at all. No one will see the inside (except for you, but you won't tell. Right?) I have found adding a pull switch is better for my LED cards You can sort of turn on the lights and let them shine and not have to push down on a button type switch. But it depends on the kind of effect you want too. Talking about switches. I wanted to show how I make mine. Here's the card with the tape and LEDs in place. The switch is on the right side. 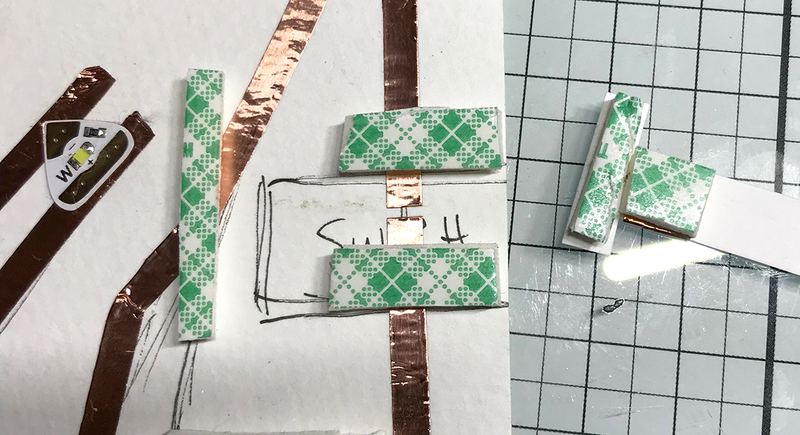 I made a T-shaped paper strip and added foam tape to the sides and as a stop to the left so you can't push the tab all the way in. I also put tape on the T-shape BUT DON'T TAKE OFF THE PROTECTION PAPER ON TOP! (you may ask why I have to actually write that out. It's because I've done it myself. More than once. Doh!) This foam tape is for pressing down the switch and making sure the connection is good. Removing the protection paper would make the switch stick to the top and not slide. Here's what the switch look under the sliding part. I cut off a tiny bit of the tape to break the circuit. 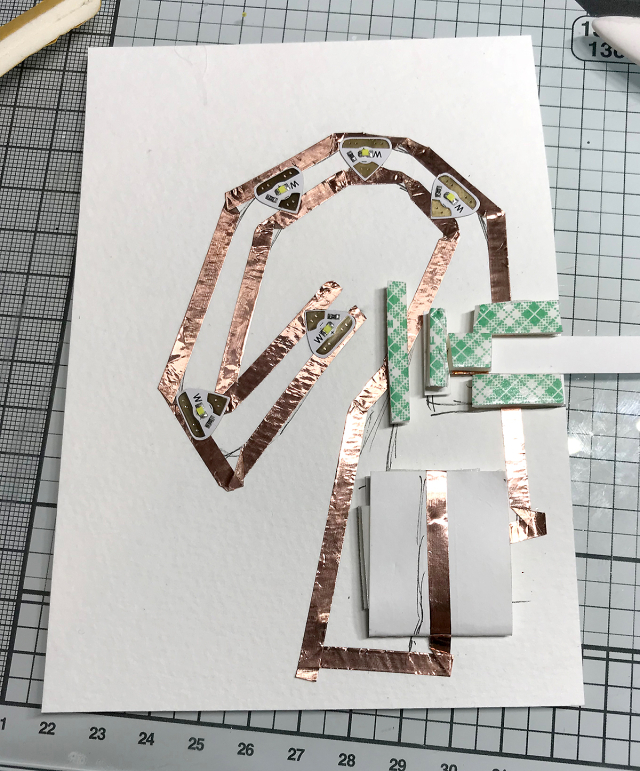 I add copper tape to the bottom of the slide, so when it covers the gap the circuit is closed again. And here's my finished card. No sentiment feels a bit weird but I guess you could stamp something on the inside to fit the occasion. I hope you got inspired and keep jumping along on the list below. Have fun and have a fantastic World Cardmaking Day. oooh.... your card is BEAUTIFUL! I love the partial die cut butterflies with lights behind them! Clever! ooooh wauw this card is so beautiful! the colors, the details... everything I love it! So special! Super pretty card! Thank you. WOW!! Stunning card. Those lighted butterflies make your card even more Amazing. What a different yet lovely card. Nice work on the background. Love this card. It looks so vintage! Oh, I didn't know you could add a pull switch, cool! Gorgeous card and it doesn't need a sentiment. This is so pretty and I love how you made the butterflies light up. Gorgeous! Oh my goodness !! How amazing is that card !?! Beautiful card! Love those pretty butterflies and how magical they look when lit up! I think this looks fabulous and I am glad you didn’t start over, the butterflies do look great with these stamps! The added lights just makes it even better. Thank You! Happy World Cardmaking Day!! Nice work in the end. Appreciate your honesty as you encountered each problem and then made it work out. Very refreshing with no sentiment. Wow, beautiful card! I love all the metallic shine and the great lights. Oh, so neat that the light shines from the butterflies! So clever! Very vintage card, the lites make it unique. I love the lights under the butterflies.. I wish all the problems I encountered turned into such a lovely card. Wow! Awesome card!!! Love it!!! Wow--this is gorgeous and so cool with the butterflies. Wow!! This vintage style is definitely unique and breathtaking! Amazing!! !